I'm not a big fan of trying different kinds of bathing soaps,though I can't say the same about shower gels..Considering its dry,my skin loves shower gels. 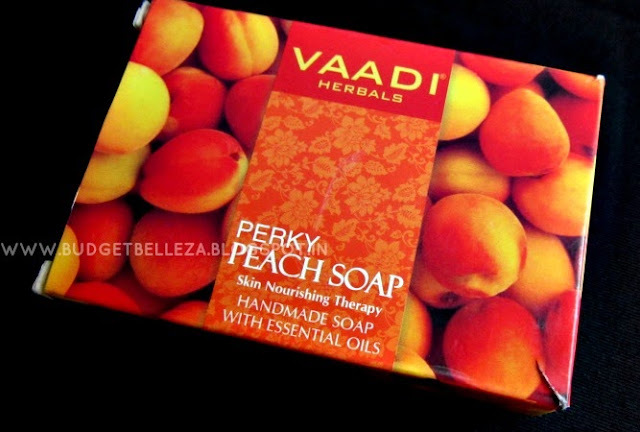 But hot and humid summers at times do call for soaps as well :) I hauled in July and along with other things I bought this Vaadi Herbals Perky Peach Soap as well..
A unique combination of natural essentials, this soap makes your skin luminous from within. It boosts blood circulation & cellular renewal, while keeping skin well hydrated. Thus it promotes newer & healthier cells; granting your skin a natural radiance! Peach: Improves Blood Circulation. Nourishes & Renews Skin. Almond Oil: Cleanses & hydrates Skin. Improves Skin Texture. Wheatgerm Oil: Promotes Skin Regeneration. Improves Circulation. How does Peach nourish and renew the skin? Peach can be termed as a surprise fruit for the skin. A very effective source of anti-oxidants, peaches do not let free radicals attack the skin surface. Vitamin A makes peach a very important nutrient to keep the skin hydrated, flawless and soft. Peach skin is an effective blemish clearer. Scars and acne marks fade away within a day or two of use. Peaches enhance skin elasticity. They help in elasticity restoration and cell-regeneration thereby preparing the skin for its everyday combat with sun, wind and pollution. Providing instant relief from allergies and redness, Peaches also have a hold over acne. A regular use of peach on the skin makes pimples disappear and also fight premature aging. What is the role played by Almond Oil in hydrating the skin? Sweet almonds' dry kernel yields almond oil. This light-weighted oil is rich in Vitamin A and D which help in treating sensitive skin with care and safeguard it from damage and allergies. Best for all types of skin, Almond Oil is a great lubricant that not only soothes the skin but also penetrates in the skin's layers It compensates for the skin's water loss by replacing it with moisture and nutrients. Extremely rich in Vitamin E, Almond Oil enhances the complexion, reduces marks, scars and blemishes making the skin brighter, healthier and pinker. What makes Wheatgerm Oil important for the skin? From the core or kernel of wheat grain, Wheatgerm Oil is extracted. With a huge percentage of Vitamin E, Wheatgerm oil gifts the skin a supple glow, treats dry patches by maintaining the natural moisture balance and also fights wrinkles and fine lines, thanks to its antioxidant properties. Wheatgerm Oil works for all skin types. On a regular application, premature aging stops and a younger-looking, even toned skin is visible. Dark spots, under-eye circles and pigmentation are effectively cured by Wheatgerm Oil. It soothes the skin and works on cell regeneration. Wheatgerm Oil works effectively by penetrating deep into the layers of the skin and providing moisture to the skin cells which in turn increases skin elasticity. Collagen production is significantly boosted by regular use of Wheatgerm Oil. 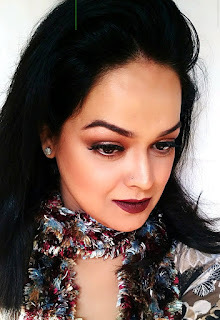 Wrinkles fade away in no time and the aging process definitely hits a halt. 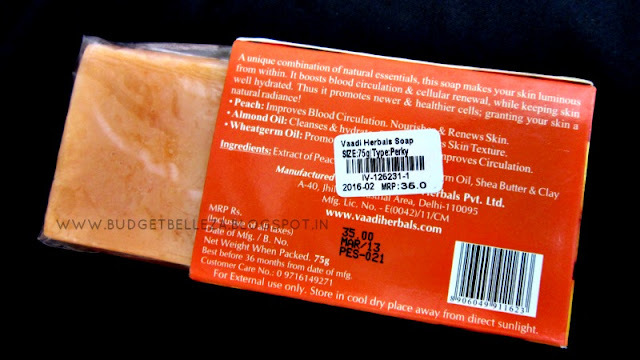 This was my first brush with Vaadi Herbals handmade soap. They come in many variants,but since I like fruity fragrances I gave this one a shot. It comes wrapped in cellophane inside a hard cover box. The smell though good is way to sweet for me to handle (lately I've noticed I have a sensitive nose,the moment I open the spice box in the kitchen... I end up sneezing several times ;) So, yeah its overwhelmingly sweet! The good thing about the soap is its moisturising abilities..Yes it does leave this dry-skinned woman feeling smooth and soft and ...fragrant too... long after the bath!!! 1. Super affordable for a handmade soap. 2. Smells refreshing (a bit too much though). 3. Has a hydrating effect on skin. 4. The fragrance and smoothness of skin stays long after the bath. 6. Claims to have essential oils. 2. I haven't come across this brand in the stores. 3. The claims list is way too exaggerated,I didn't notice any difference in my skin texture or quality. 4. Sensitive noses might start sneezing! Nice moisturising soap for the price..if only it didn't melt off so quickly. I havent tried this brand yet but it sure does looks interesting, nice review. I have tried their lavender soap and I loved it! Completely value for money. Try washing your hair with the soap. It does a wonderful job there as well.